Wondering where to eat in Cadiz? 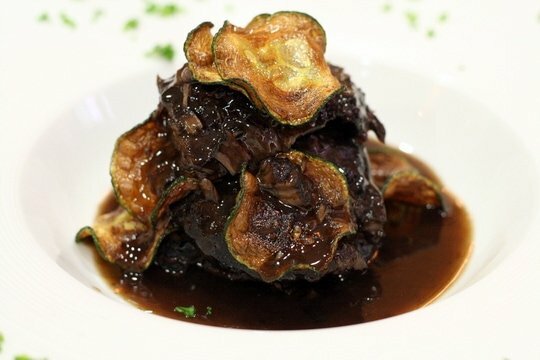 Not only will I share my favorite local spots below, I’ll also tell you the 14 must try foods in Cadiz so you can be sure to order well in this foodie paradise! 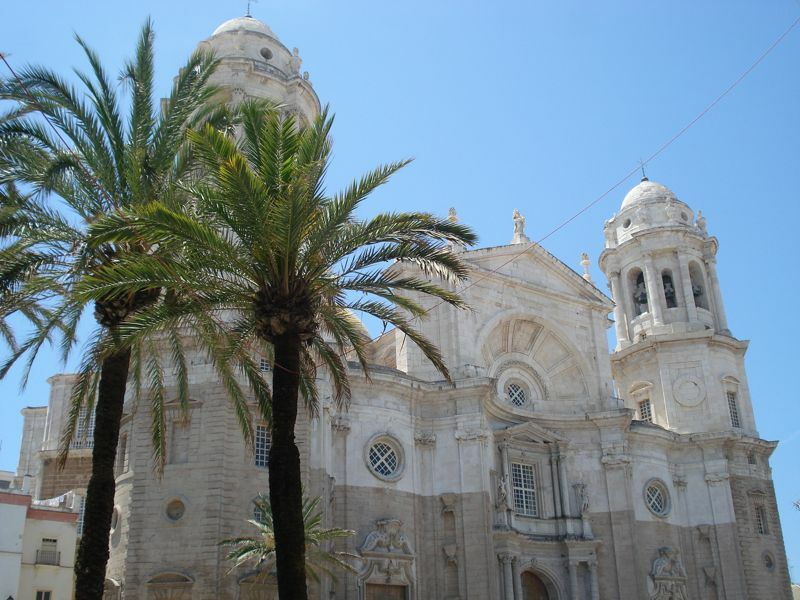 The first time I visited Cadiz I approached it by boat as we made our way over for a day trip from El Puerto de Santa María. As the shore came into focus, I could just tell I was going to love it. Cadiz is an old city (one of the oldest in Europe!) and is not picture perfect. But what I often call “ugly-pretty” is what really draws me in. I adore the tiny fishing boats that look like they’re about to break apart in the waves, and the peeling paint on some of the gorgeous, century-old buildings. Cadiz is a city that will always hold a special place in my heart. It’s the place where I got engaged to Alejandro, on a chilly December afternoon when we should have been in France! It’s also the place where I fell head over heels in love with some of my favorite Spanish foods: salmorejo, dorada, tortillitas de camarones. (Thank you Cadiz!). Since Alejandro’s parents live only 20 minutes away, we’ve visited the city many times. And although I’ve never even spent the night, I’ve definitely done my fair share of exploring the Cadiz food scene. Nearly five years after my first trip, I’ve narrowed down a pretty good guide to eating in Cadiz. Hopefully, it will help fellow food lovers explore one of my favorite cities in Spain! I hope you enjoy my recommendations for eating in Cadiz, feel free to add more places in the comments. 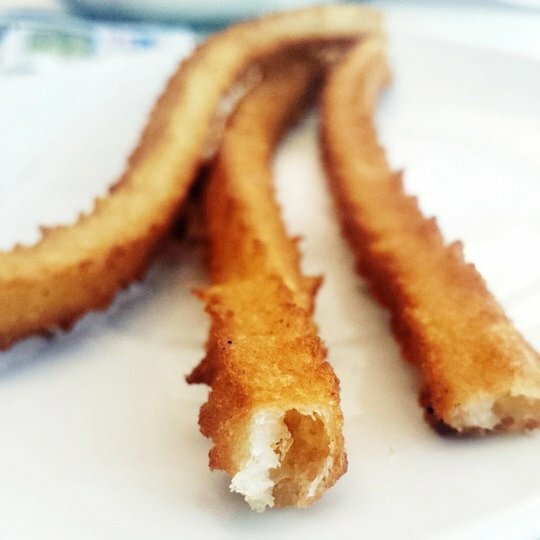 The crispiest churros in Spain! Not what you were expecting? 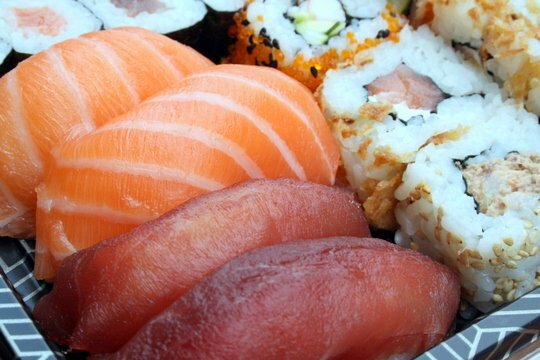 Cadiz is a wonderful place to get your sushi fix— granted it’s made with the area’s top quality catch! Spain is the world’s second largest producer of tuna and some of the best bluefin tuna comes from Cadiz– though 80% of it gets sent to Japan! Gadisushi is one of the booths serving food. 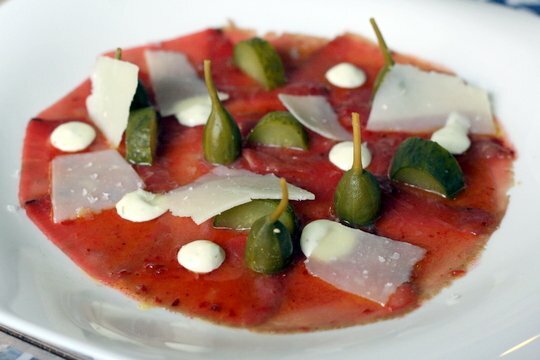 Raw tuna from Cadiz is our recommendation! 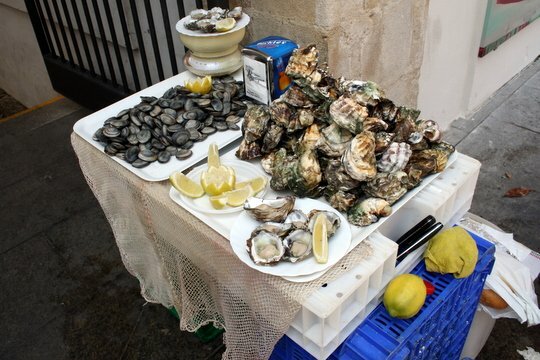 The oysters in Cadiz are fat and juicy, perfect with a squeeze of lemon. On the market’s outskirts you’ll find people selling things like oysters and tiny shrimp. Tiny shrimp called camarones are served from little cones after being quickly boiled and chilled. 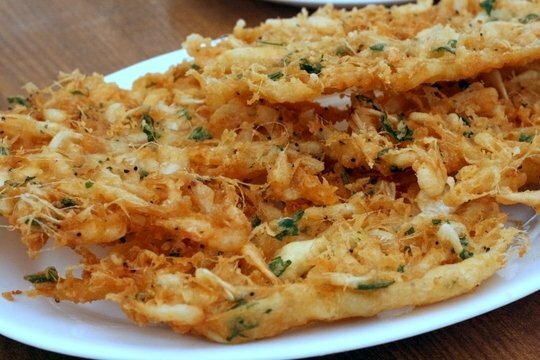 But the best way to enjoy these sea critters is in a crispy tortillita, a shrimp fritter that is absolutely to die for. The bluefin tuna from Cadiz is simply incredible. If you visit during the almadraba every May (when fishermen are allowed to fish the tuna using a 3,000 Phoenician fishing method) you’ll be in store for some of the freshest and most delicious tuna of your life. 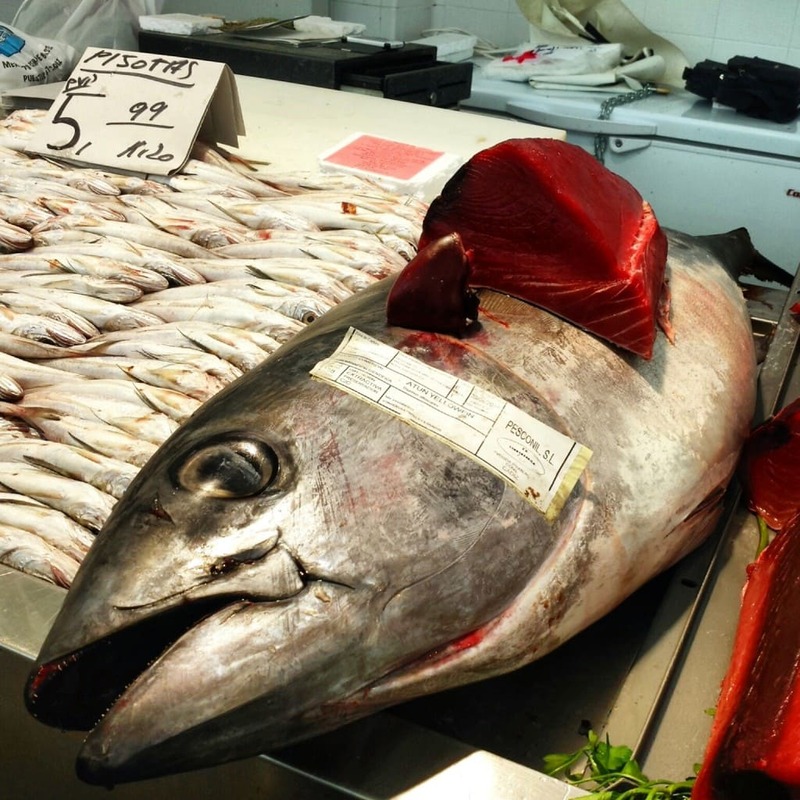 Bluefin tuna at the Cadiz market. Pork belly cooked in lard and smothered in garlic that is then sliced thin and eaten cold with lemon and salt, or a savory mojo picón sauce. Sound like heaven? Nope, just Cadiz! 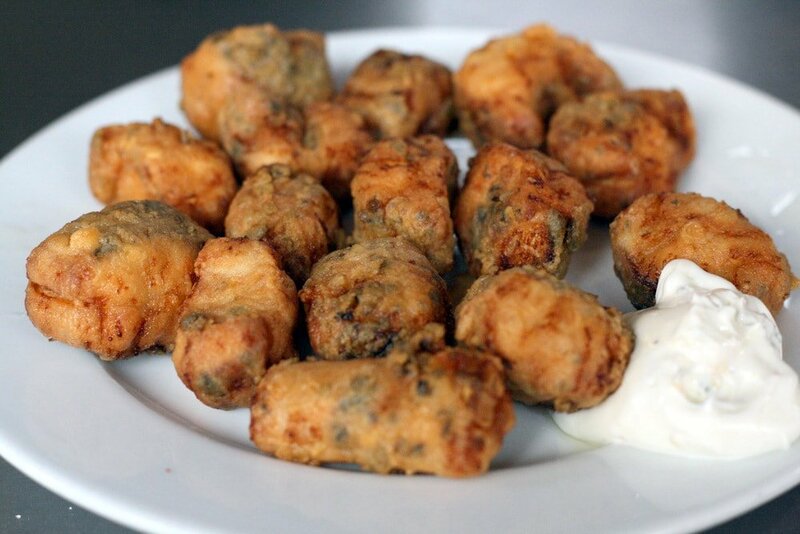 Chicarrones de Cadiz with mojo picón. Cadiz is one of the best tapas cities in Spain. Nearly every restaurant will have a tapas portion on their menu. Tapas are generally meant for one person, or for sharing among two. For bigger groups go for a 1/2 ration or a full ration (1/2 ración, ración). Example of a tapas portion. The city of Cadiz may not be a part of the Sherry triangle, but the locals certainly support their neighbors! A crisp glass of fino with some of the area’s best seafood is a must. 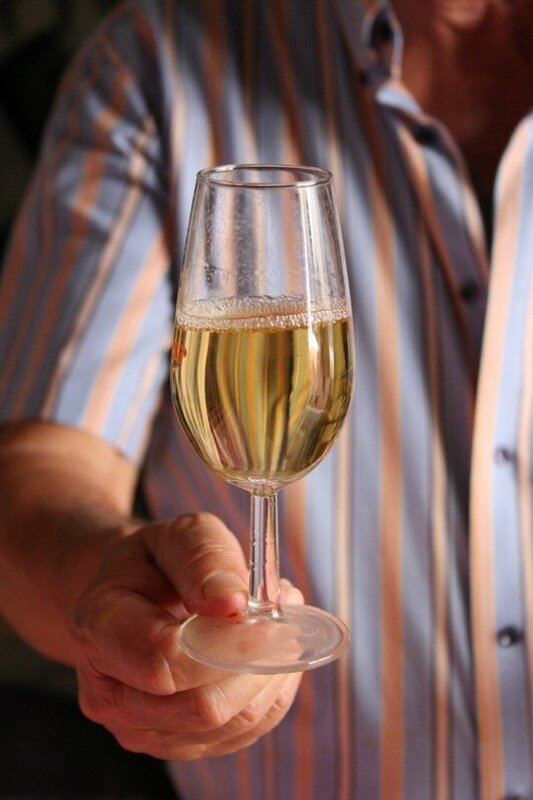 Enjoy a glass of crisp sherry (fino or manzanilla) with your fried fish! 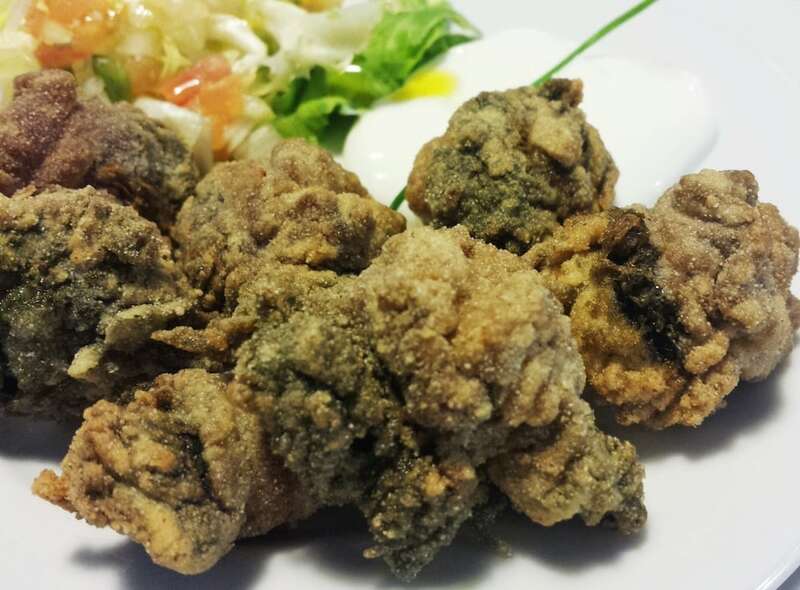 Ortiguillas are among the most bizarre foods you’ll find in Cadiz. Divers gather sea anemone, which are then battered and deep fried. Not for the faint of heart, they are a true taste of the sea. A popular addition to salads or a key part of a fried fish platter, these fish egg sacks (they could be from a variety of fish/cuttlefish, such as hake, cod, and squid) are not my personal favorite (but my in-laws swear by them!). Gambas, gambas, gambas. I could easily eat plate after plate, with another glass of fino. 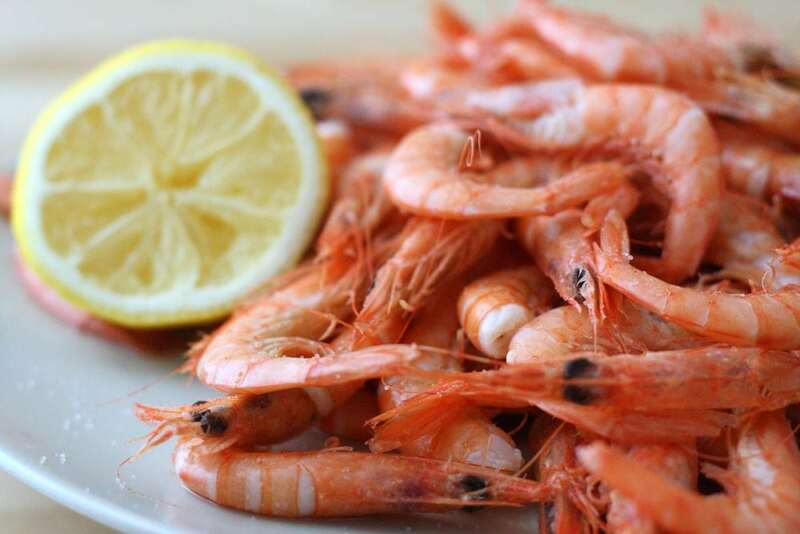 Check out my boiled shrimp recipe! Call it sandshark/dogfish/whatever you please. It’s delicious. Fried in an irresistible coating of breadcrumbs, lemon, and cumin I could eat it every day. 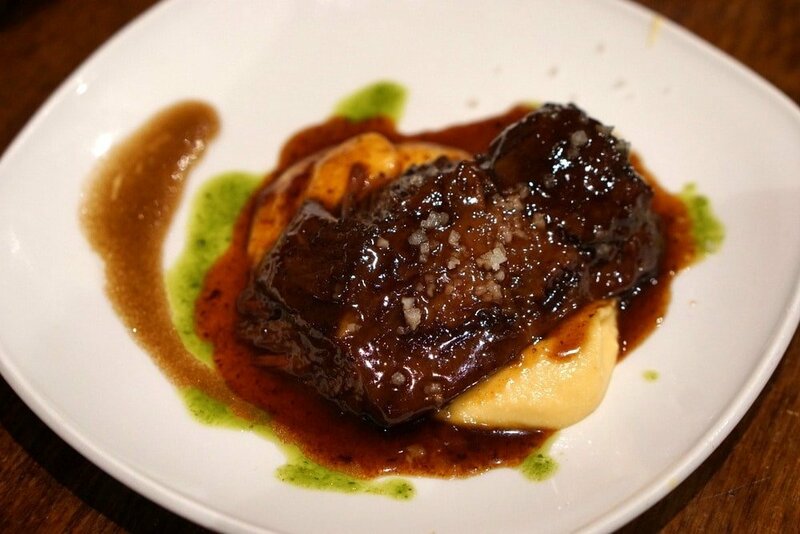 One of my favorite tapas in Cadiz, you’ll find carrillada de cerdo on offer all around town, generally swimming in a simple wine reduction. I loved this newish Cadiz tapas bar so much that I dedicated a post to our outstanding lunch there. I almost don’t want to go back, just in case it doesn’t measure up. This small restaurant is the definition of what I search out– clean and fresh flavors, creativity that doesn’t cross into the bizarre, and the best quality products you can find. Good job guys! Old school and wonderful, the walls are covered with pictures of bull fighters and flamenco dancers. Order a sherry and some cold tapas– their chicarrones de Cadiz are wonderful. This is the most traditional of Cadiz’s fried fish joints, located in the beautiful Plaza de las Flores. The cazón en adobo and the chopitos are my favorites. Fried cazón en adobo in the Malaga market. Recently restored, the central market of Cadiz is the place to be for fresh food and cheap tapas. 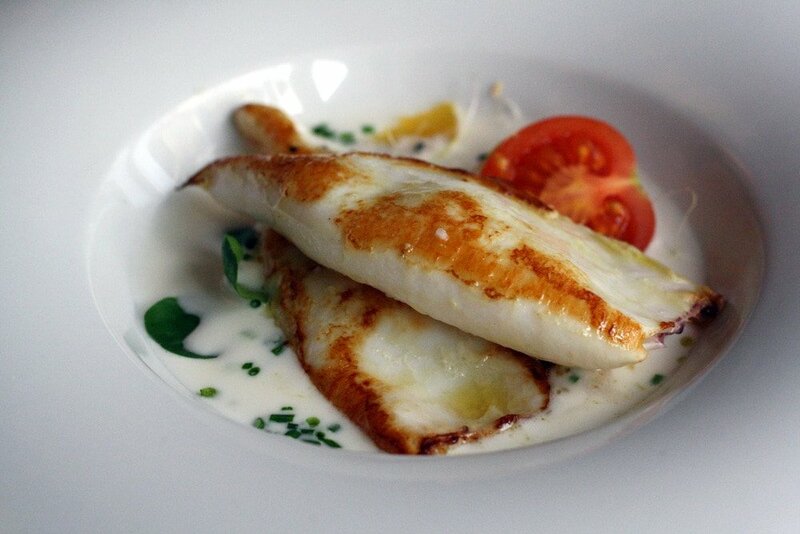 The fish market is a MUST when visiting Cadiz– don’t forget there’s no fish on Mondays! 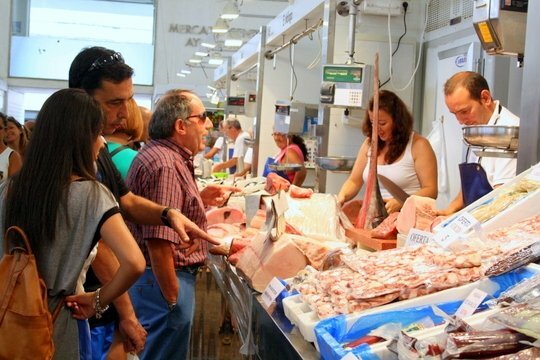 The Cadiz market also boasts a wonderful Rincón Gastronómico (a dreamy outdoor food court). Food lovers can enjoy local wines, craft beers, fresh sushi, fried seafood, and much more with great views of the historic market. The heart and soul of the market is the fish section. It is stunning, and will make you wish you had a nearby kitchen. One of the most popular of the booths in the Cadiz market, Gadisushi makes fresh makis, nigiris, and sashimi before your eyes, using fish from the market. Must I say more? Another Cadiz classic (and right next to La Candela) come for a quick aperitif before lunch. Rustic and wonderful, don’t be intimidated by the old school charm. One of my favorite pastry shops in Cadiz is located right across from the cathedral. You must try their homemade donuts and savory empanadas– but everything at Casa Hidalgo is absolutely delicious. There is excellent seafood in Cadiz and it’s cheap by most peoples’ standards. If not in town long, skip the fancy restaurant meals in exchange for tapas style dining. Trying many dishes all in the same night (and often at more than one establishment) can’t be beat! At least TRY the local sherry wines. I know that sherries can be tricky for some people to fall in love with at first sip– but keep trying! Sherry wines should pair with food, so ask your waiter for a recommendation (or better yet, look around and see what others are drinking) and sip with your food. And you can never go wrong with a crisp glass of fino (so try that!). You aren’t expected to tip in Cadiz, but rounding up the bill and leaving up to 10% for excellent service is definitely appreciated. Servers work hard and earn a low monthly wage. Don’t take offense when waiters are running around and slam down your drink– it’s not rude, just a part of the show they put on! BYOT– bring you own toilet paper! For reasons beyond my comprehension, many restrooms do not have toilet paper or soap. Come prepared with tissues and hand sanitizer for peace of mind. Embrace the afternoon merienda. From around 5:30 to 7:30 you’ll see locals having a drink and a bite to eat in local cafés and pastry shops, instead of having dessert right after a meal. Cadiz is a beautiful city with a unique Andalusian spirit. Take your time and walk around without a map, listening for impromptu flamenco music and looking out for old style tapas bars filled to the brim with locals. Eat, drink, stroll, and repeat– it’s what the gaditanos do! 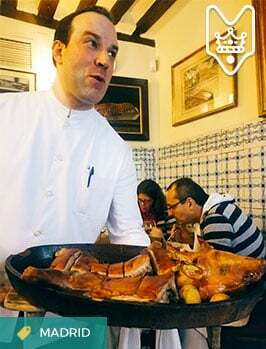 If you have more tips for where to eat in Cadiz or the top must try foods in Cadiz, please leave them in the comments! Wow! What an amazing guide to Gaditano food—accompanied with mouth-watering photographs, to boot. I had no idea Cádiz was home to high-quality sushi, those whole-fried shrimp fritters, or even sea anemones! Love all these recommendations, both the dishes and the restaurants. BTW do you know why the cathedral is two-toned (bright white on top and grayish-brown below)? Was it attacked in the Civil War, or restored/rebuilt recently? The explanation that I’ve heard is that the darker stone is what is found regionally, which is why you see many churches and other buildings made of a similar stone in Andalucía. The white is a type of marble which isn’t mined in Spain and was a gift from Italy. The cathedral was also constructed over a large span of time (more than a 100 years) so that may be a factor as well. Superb post Lauren. We have just returned form our regular summer holiday in Cadiz. We were lucy to have been given insider tips from a local and you have covered all of them except patatas aliñadas. 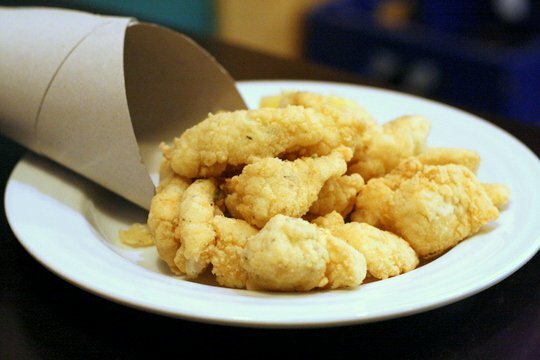 Have you eaten them in Cadiz too? Uhm, hola … mariscos y tortillitas de camarones: más más más … er … por ‘fa! Nom, nom. You’re making me hungry. I have always wanted to try dogfish (it’s fished in the U.S., but generally not sold here). Great photos! 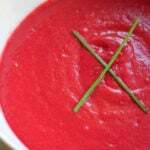 Fabulous mouthwatering article. Love Cadiz….such as brilliant and unique place only a short trip from Gibraltar and the wonderful Costa de la Luz. Great value too. Recently spent a great afternoon at the Mercado de Abastos. Can’t beat having lunch and picking up fresh seafood for dinner! The market has come a long way, even in the few short years I’ve been living here. It’s great to see it revitalized and with so many new food vendors. How did I miss this before?! Great post! I love gritty but charming Cádiz, and especially love the food. Hi. I am loving your blog and it is an invaluable resource for the upcoming. Since you know all these places so well and seem to love food and culture as much as we do, if you had 3 nights and the better part of 4 days to spend around Sevilla, would you recommend a day trip to Cadiz , an overnight in Cadiz (possible stop in Jerez or Puerto de Sta. Maria), or focussing on Sevilla? If we did an overnight, would you recommend Cadiz or Puerto Santa Maria? Its so hard to decide when we haven’t been any of these places yet. (Our one other stop in Andalucia will be Cordoba on a Saturday night during the last feria in May). Hi Mona! I’d say either to stay in Seville, or to make a full day/overnight trip of Jerez and Cadiz. You could take an early train to Jerez and spend a half day there, visiting 1 bodega. Then you could continue on to Cadiz, and spend the rest of the evening and a bit of the next morning before heading back to Seville around noon. Hope this helps! Hi Lauren. Thank you so much! I’m so excited to explore and eat, and sometimes its hard to know where you might be pushing the itinerary a little too much or you would be missing out on a great treasure that was so close, especially when you have never been to those parts. I really appreciate your input as someone who knows the area well. 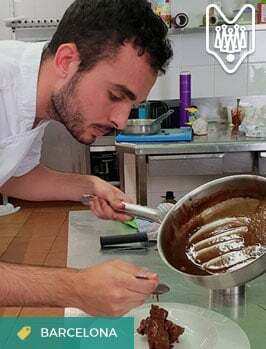 You’re very welcome– it’s such an amazing area, I’m actually living in Seville right now starting Devour Seville Food Tours here and I forgot how much I’d missed it! I’m a big fan of slow travel, yet at the same time hate to miss things too. I will say that going to Cadiz for the day would be pretty special. Enjoy your trip! Thanks! Do you happen to offer your food tour in spanish (i will be travelling with my husband and his parents. my in-laws speak spanish, but limited english). also, just to clarify, you would recommend Cadiz for an overnight instead of just a day trip? still haven’t finalized plans but hope to do so soon! 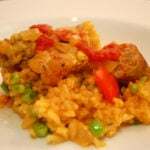 Excellent, excellent recommendations for restaurants in Cadiz, and the “must order” delicacies! We loved your suggestions – especially sushi at the market 🙂 Keep doing what you are doing…this website is awesome and even though I’m back in the States now, I can’t stop reading and sharing with friends and family. Thank you, Lauren! Pingback: 3 Spanish Road Trips for Wine Lovers - An Insider's Spain Travel Blog & Spain Food Blog! You should add Restaurante Cafe Royalty to your “Where to eat in Cadiz” list. 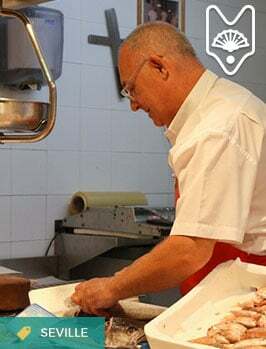 Traditional kitchen updated with the best products of the province of Cadiz. Also it’s the only historically preserved grand romantic cafe in Andalusia and probably in all of Spain. I was pleasantly surprised to discover that you have a gastro guide to Cadiz here on Spanish Sabores. I’m hoping to make a day trip to Cadiz during my stay in Seville next month. I had wanted to go to Cadiz last year, but Andalucia was experiencing two days of torrential rains, so we decided to remain in Seville. I loved the blog post and was so excited to try your recommendations. I was so excited to try the tortillitas de camarones, but they needed a dipping sauce like guacamole, sour cream, or hollandaise may have been good. I also tried albondigas de choco. I ate them, but I wouldn’t recommend either dish. Neither were anything I would ever eat again by Will. It might help in future posts to list where you ordered the items. We ended up at Arte Serrano, which had great service; I guess we just ordered the wrong items! Cádiz is a beautiful little town and it was fun to experience Carnaval, even by happenstance.